Morris dancing is an ancient English ritual folk dance. Most Morris dances come from the Cotswold region of England--each village had its own particular style--though there are types of Morris from the northwest and the Welch border. The dancers wear white clothes with brightly colored ribbons and vests/sashes/baldrics, with clusters of bells tied to each calf, waving hankies or sticks. They usually dance in groups of six, along with a musician and often one or more "characters," the most common being the fool, the hobby (originally a horse, but it varies with the team), and the Betty (a half-man, half-woman). Historically, the Morris was danced exclusively by men, but there is evidence that, like many historical accounts, it does not entirely correspond to reality. In any event, male, female, and mixed teams (or "sides") all abound today. Morris dancing traditionally takes place in the late spring into the summer, and is generally thought to bring fertility to the crops (and the people); however, there are many different theories on the origin of Morris dancing, as can be seen by following the preceding link many times. Arguably the most important day is May Day, when Morris teams all around the world dance the sun up. More information on Morris can be found on Rich Holmes's Morris site (among others). What does this have to do with the Woodwards? 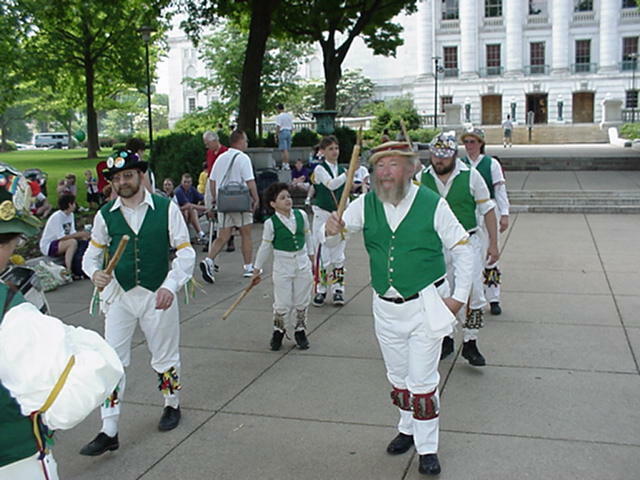 Trip has been a Morris dancer with Oak Apple Morris (Wisconsin's only active Morris side) since 1998; the bottom right photo shows him performing at the Dane County Farmer's Market in 1999. (Click on this or any photos for larger and/or uncropped versions.) 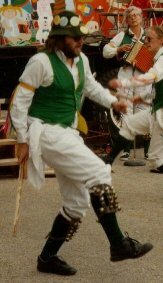 Carey has been a Morris dancer since 1987, mostly with Oak Apple, but also with Lemon and Capers Morris (which has since transmuted into Red Herring Morris) in the Boston area. 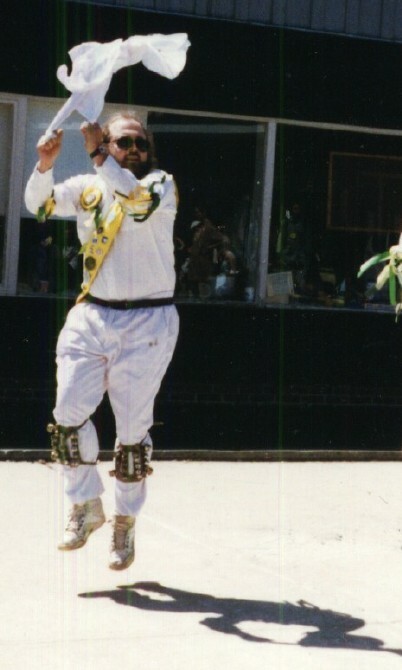 The bottom left photo is Carey dancing with Oak Apple sometime in the late 1980's; top left shows Carey dancing Simon's Fancy with Lemon & Capers at NEFFA sometime in the mid 1990's (and casting a shadow that looks remarkably like Kokopelli); and top right is also Carey in his Lemon & Capers days, helping Trip with a maypole dance at Natick [MA]'s May Day festivities. More coming Real Soon Now. Back to the Woodwards' home page.